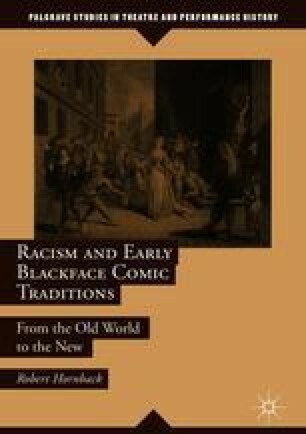 This chapter focuses on anti-black proto-racist ideology and Christian iconography informing comic representations like Harlequin. It examines, for instance, metaphysical lore and related moral allegories ascribing immutable intellectual extremes to light versus darkness, and white versus black, that were eventually applied in racial thought. A metaphysical typology ascribing folly and irrationality to blackness rather than more familiar Manichean good/evil dualism was often most at issue in colonial allegorical thought. Noting Frantz Fanon’s observation that the colonial world’s “metaphysics” aimed at “decerebralizing” dark-complexioned colonized peoples, this chapter traces the historical roots of this colonial project of ascribing immutable irrationality to blackness back to its chief sources, St. Augustine, the Curse of Ham, and the Psalter insipiens. This alternative metaphysics of folly in which black devils of “colore nigro” recalled the stupid Roman stage fool (the “stultus”) created a highly influential trope in medieval and Tudor drama, especially allegorical moral interludes. With the spread of pan-European blackface fool traditions alongside the slave trade, the logic of such iconography and its terminology were applied frequently in trade encounters where Europeans called Africans “the ignorant people,” “foolish,” “clownish,” and lacking in “wit” and “reason.” Thus, conceptions developed in religious traditions, in which blackness served as a metaphysical mark of inherent mental debility, were deployed in the promotion of real-world proto-racist stereotypes that were, in the end, damning less in terms of ascriptions of evil than of innate folly. That is, Augustinian and Hamitic allegories rather than Manichean ones had the greatest influence in the development of anti-black racism. Allen, Arthur. “Charging into the Minefield of Genes and Racial Difference: Nicholas Wade’s ‘A Troublesome Inheritance.’” In “Books of the Times,” The New York Times, May 15, 2014. Accessed December 30, 2017. www.nytimes.com/2014/05/16/books/nicholas-wades-a-troublesome-inheritance.html?_r=3. Murray, Charles. “Charles Murray’s SPLC Page as Edited by Charles Murray.” AEI Ideas, AEI, March 24, 2017. http://www.aei.org/publication/charles-murrays-splc-page-as-edited-by-charles-murray.